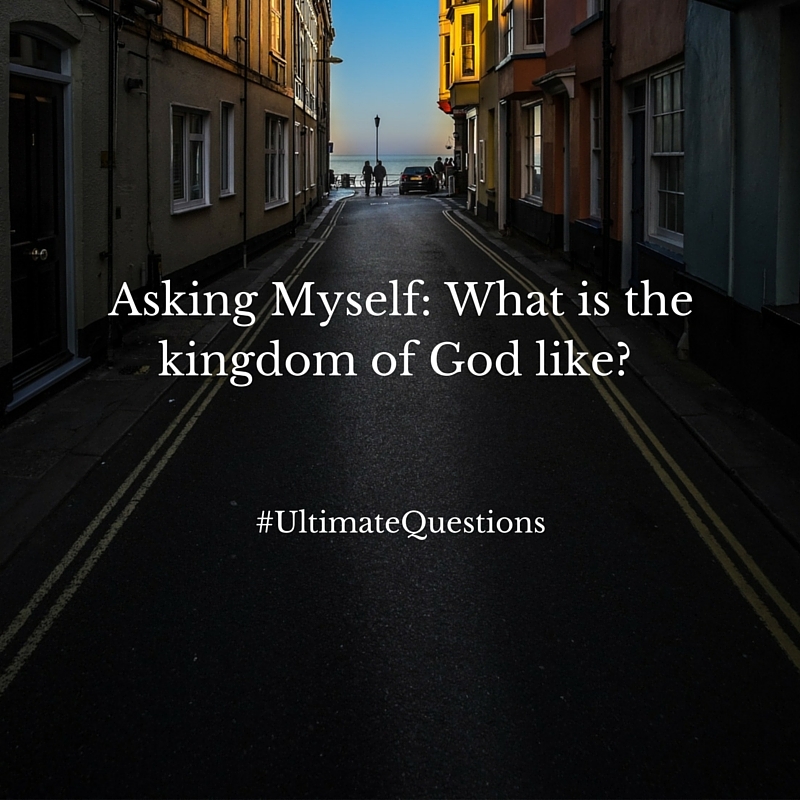 Behold & Reflect: Asking Myself: What is the kingdom of God like? Asking Myself: What is the kingdom of God like? This is the 18th post in my series "Asking Myself," in which I weekly ponder one question posed in Teresa Blythe's rich book, 50 Ways to Pray. You can find the start of the series here and last week's post here. The first nine posts focused on theological musings, while posts 10 to the present prayerfully consider the specific questions Jesus posed in the New Testament. Before reading this question in the context of Luke 13:18, I experienced a flash of emotions when I saw it: Confusion. Anxiety. Hopefulness? The confusion came from trying to remember the difference between the kingdom of God and the kingdom of the heavens. The various kingdoms always confused me... despite (or perhaps because of) the fact that my church had an elaborate Venn Diagram addressing them smack in the middle of the gospel of Matthew. The anxiety also stemmed from the crispness, intricacy and technicality of the aforementioned Venn diagram. It's a puzzle to be figured out. It's who's in and who's out. It makes me think about overcoming and not overcoming. It makes me think about 1000 years of reward or the alternative. It brings to mind words like rule, command, authority, dominion and battle. It gives me a feeling like I'm out of my element, and out of touch with the King. In my mind, there's a lot of negative noise connected with "kingdom." But after I've worked my way through those darker places, there's a surprisingly sunny patch of hope waiting for me. This hope illuminates another paradigm in which the rule is the Golden Rule (Matt. 7:12) and the command is simplified down to the Greatest and Second greatest commands (Matt. 22:36-39). The authority goes to the meek; the honor goes to the ones who serve their socks (or tunics) off. Dominion has more to do with homemaking and abiding than oppressing. Tears from battle wounds are wiped away. I think you can tell I like dwelling in a place of hopeful imagination. In imaginative prayer, God's kingdom as an invisible realm becomes a visible glimmer here and a tangible gleam there, and a growing, glowing in my heart as I commune with God and in fellowship with others. The fact Jesus was struggling to explain it gives me further permission to be pleasantly confused. In an answer to his own question, Jesus compares the kingdom of God to a tiny mustard seed that takes root and grows into a big, branchy tree that becomes a roosting place for a menagerie of birds. The impressions I take away from this? The kingdom of God is wild, beautiful, diverse yet united, verdant, sheltering and sustaining. Jesus uses another mustard seed metaphor in Matthew 17 to refer to powerful faith. So all this kingdom beauty sprouts from just a speck of faith. Back to Luke 13. Jesus also tells the parable of a woman hiding a little lump of leavening in a sack of flour. When she comes back to it, the entire bag is inoculated. I wrestle with this parable a little because my ingrained, childhood church's interpretation was that leaven typically symbolized sin and, therefore, the kingdom of God encompassed all those who claim to be Christians, including many false believers, and a Christian religion that breeds all kinds of crazy, anti-Christ behavior. But what if not? What if Jesus used familiar metaphors in new ways? What if he was looking at the bright side of leaven? In this case, let's assume God's kingdom is entirely godly and Jesus-like. Let's imagine it like a fresh, yeasty pillow of dough ripe for the oven, ready to pass through fire, with a destiny of nourishing and sustaining and bringing people together around a table of feasting and fellowship. What if the kingdom of God is so cozy and intimate like that? So humble and homey? Sometimes the simplest things are the precious ones. The woman's hiding the lump recalls to mind a kingdom of the heavens parable about the man who found the treasure hidden in the field, then hid it again so he'd have time to sell every last thing he owned and buy the field and its secret treasure. The woman's hidden treasure might not have much monetary worth, but it's precious, tiny, thriving and alive, ready to multiply indefinitely if given the right conditions. Sometimes the hidden things are very, very positive. If you spent any time in church as a youngster, I bet you remember being admonished to hide God's word in your heart. I keep a few bits tucked away. Like the verse about how our true life is hidden with Christ in God? So. I can't tell you exactly what the kingdom of God is... possibly because of the wonderful way that God hides himself and keeps the Christian life pleasantly confusing. But I can tell you that my impressions of what the kingdom of God is like compel me to seek it above all else.